This kitchen was designed by Coral Gables, Florida-based design firm Dunagan Diverio. 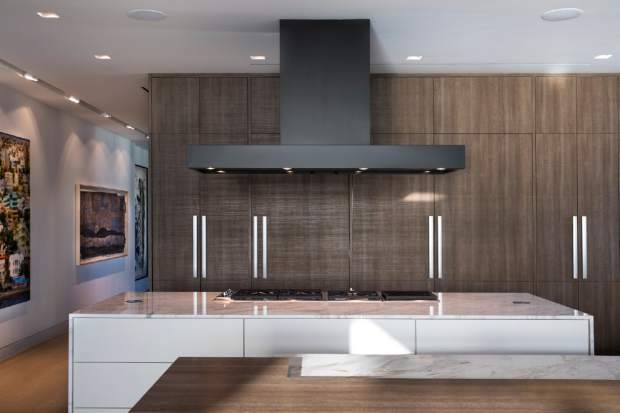 The Custom cladding appliance fronts and cabinetry create an integrated, serene sightline throughout an open plan kitchen and living space in this Miami Beach penthouse project. Leaving walls free so art can be exhibited also helps minimize the utilitarian aspects of the workspace and adds to the cohesive overall look. It was important to have the finishes all work together, said her partner, Tom Diverio. Architect Dan Brunn in Los Angeles said he, too, keeps flooring the same throughout an open-plan home. Dunagan said the inspiration for the Florida penthouse came from yacht design, in which all available space is maximized. A coffee station got tucked behind pocket doors. A laundry room, service kitchen and Sub-Zero appliances are also concealed behind wood doors or cabinets in the kitchen. Henrybuilt, a Seattle designer and maker of kitchen furniture and storage systems, offers solid-surface counters with drainage for the sink. Storage cubbies for tools, napkins and bread are built into milled wood counters, which are then extended to create eating tables. Knife blocks, utensil, spices, pantry items, and recycle and trash receptacles all fit neatly out of sight in drawers and sliding cupboards. Pay attention to how you illuminate the kitchen, said Sheva Knopfler, creative director of Brooklyn, New York-based Lights.com . “A statement light allows you to add a bold dash of your personality. It becomes the ‘artwork’ of the space,” Knopfler said. Consider a large chandelier, or a grouping of pendant fixtures.